Camping, backpacking or beach-going are all terrific family activities. Whether you want to camp with your spouse and two children, grandparents or other relatives, you should look for the best tent for family of 4. But who makes the best family tents? What features should you look for in the best tent for family of 4? Which aspects should you avoid? Find the answers to all of these and more in our best family tent review below! What is the Best Tent for Family of 4 in 2018? 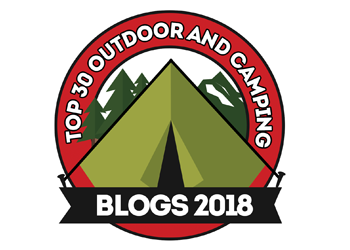 Prior to breaking down our favorite picks for the best tent for family of 4 this year, you can learn the basics about each tent below. Aside from the tent’s measurements, weight, footprint, center height, and the fabric it’s made of, we’ll also talk about every tent’s build, set up, resistance, and overall quality in the second part of our guide. If you checked out our best 6 person family tent guide, you already know that we’re in love with the Coleman brand. The well-established tent brand has designed some of the best family tents for camping on the market, including the Coleman Instant Cabin 4. Priced at around $100 on Amazon, the 4.4-star rated tent is possible the best Coleman family tent for smaller families that still want to enjoy plenty of room. Coleman is reputed for using some of the best fabrics available for their tents. The Instant Cabin 4 is designed with 150D taffeta polyester and 68D mesh polyester, with a 1000D polyethylene floor for extra durability. Like the name suggests, the Cabin 4 instantly pops up, with an assembly time of literally 60 seconds. Getting the tent set up is literally an effortless, one-person job, just like the disassembly. We wish ventilation could be better though. Quality and Coleman are almost synonymous in the camping accessories industry. Although the company indeed makes the best camping tents for families, some models seem to have minor issues with leakage. To avoid any unpleasant surprises on your camping trip, consider purchasing their rainfly accessory separately. Aside from that, the tent is as sturdy as can be, even withstanding harsh thunderstorms. You should get the Coleman Instant Cabin 4 if you want a terrific tent for camping with your 4-member family. We do recommend getting the extra rainfly if you’re going on a camping trip during rainy seasons. You may not have heard of Toogh until now, but you’ll be happy to discover that they have one of the best family tents for bad weather. The Toogh 4 Season is an Amazon best-seller with a huge 4.4-star average rating from customers. Available for approximately $65 on the website, it’s among the best waterproof family tent options you can consider for camping during any season. It’s a great example of a lesser-known brand with reliable products. When shopping for a 4-season tent, design is of the essence. You should always look out for a tent that uses durable, quality fabrics that can withstand rain or shine. Toogh used strong, 210D polyester fabrics for their 4-season tent, which also features a 2-door design. With 83 x 90 x 59-inch measurements and an 8.3 x 9 footprint, the Toogh 4-season also stands out as the best tent for large family on our list. 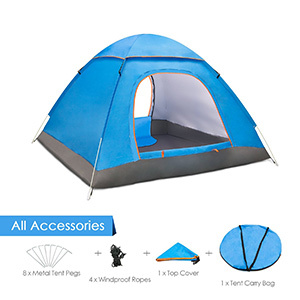 Even though some users complained about cheap-feeling materials, the Toogh tent can help you plough through unfavorable weather conditions while camping. It seems that the company has some QA issues, with quite a few tents breaking after taking them down, but you should contact their customer support if you get a defective unit. Otherwise, the cross ventilation, waterproof materials, and pop-up construction will convince you to buy it. We recommend the Toogh tent as the best tent for family of 4 for any camping season, whether hot or cold. If you have any problems with the product you receive, simply reach out to Toogh for a replacement. Numbers talk, and those associated with the SEMOO (smt103101) tent speak loud. Not only is it the 8th top-selling tent in its Amazon category (Backpacking Tents), but it also has an average rating of 4.4 stars that results from satisfied customers. It may not be the best 3 season family camping tent as advertised, but at around $50, it’s an amazing value. You can use this tent for camping just as well as for backpacking. The SEMOO is possible the best family dome tent on our list, at least according to customer feedback. It weighs only 7.26 pounds, making it ideal for lightweight camping. We love how you have a little screen room in front of the tent so you can leave your shoes out front. The set up may be a bit more difficult than with other tentss on our list, as you need to put together 19 stakes and 6 guy lines to get the tent up. While the SEMOO tent is indeed a quality tent, it may not be adequate for 3 seasons, like the company advises. Some users have complained that the rainfly is ineffective during bad weather, and that you may get leaks through the bottom of the tent too. However, you can solve both of these issues by getting extra protection. The multitude of steel stakes that the tent uses ensure sturdiness even in windy conditions. We support the SEMOO (smt103101) as the best family tent for camping lightweight. It may not be ideal for 3 camping seasons, but it’s a best buy for backpacking or a camp out during the summer. We also recommend it as the best family tent with screen room. While most of the tents on our list are dedicated to camping, some families want to get one for staying safe when out on the beach. 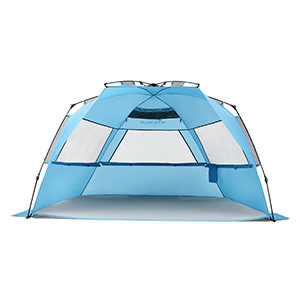 If you want one of the best-rated family tents for seaside chilling, we recommend the Pacific Breeze Deluxe XL, which costs about $100. The tent has a massive 4.7-star average rating from over a thousand customers, a fact that has most likely also contributed to its best-seller status (#8 Amazon Sun Shelter). Unfortunately, quality seems to be the area where the Deluxe XL tent is lacking. Judging by consumer feedback, it initially appears to be one of the best quality family tents for beach use. Notwithstanding, a number of customers complained about poor quality control on behalf of Pacific breeze. Setting this aspect aside, the 5 sand bags ensure stability, even in the toughest of ocean winds. We encourage you to try the Pacific Breeze Deluxe XL tent if you want the best tent for family of 4 while at the beach. The stability, protection, and ease of set up make it a great value for safe fun in the sun. Avid backpackers know how challenging it is to find the best family backpacking tent, due to the abundance of small tents on the market. Nevertheless, the roomy yet lightweight ALPS Mountaineering Lynx 4 can easily accommodate a family of four. You can buy it for about $250 on Amazon, but the company is known for offering huge discounts (even over 50%). At the time we were writing our review, it was $130 and the 5th top-selling Backpacking Tent. Even though the Lynx 4 isn’t the lightest tent on our list, it is the best family tent for camping and backpacking on rugged terrain. This 4 person tent measures 23.9 x 6.5 x 5.9, weighs about 7.9 pounds, and is quite simple to set up, so it’s still convenient for backpackers on long trips. However, it does have some notable design flaws, like contradicting sew-in loops for the poles or the impossibility of covering the window. All in all, the Lynx 4 appears to be a high-quality tent that’s well worth your investment if you frequently backpack. It’s also the best camping tent for family use, thanks to the generous size for a model in its class. There are a few minor reports of leakage, but you can buy a floor saver if you want to prevent any inconveniences. We also wanted to add that the Lynx 4 is remarkably sturdy, ideal for camping in regions with strong winds. You should invest in the ALPS Mountaineering Lynx 4 if you want the best tent for family of 4 that was specifically designed for backpacking. The high-rated tent is perfect for parents who want to take their kids trekking in the great outdoors. Not everyone knows how to set up a rugged tent with stakes and guy lines. Still, nowadays, you don’t even have to stress with a complicated setup. 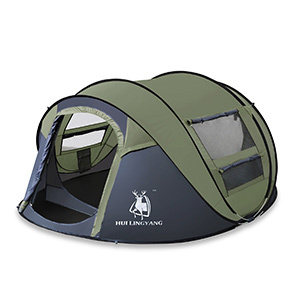 Although there are numerous pop-up tents on the market, we suggest you look into the HuiLingYang Instant Pop Up 4 tent as one of the best family camping tents. The tent is about $130 on Amazon and it’s also the best family tunnel tent for families of 4 or less, providing plenty of space for its size category. The HuiLingYang tent is exactly as described in terms of assembly. All you have to do is remove it from the carrying case and throw it up in the air in a larger space. It literally pops open and is ready to use in a matter of seconds. You can choose one of four colorways for yours, whether army green, blue and navy, blue and yellow, or yellow and gray. Its 78.74 x 114.17 x 51.18-inch dimensions make it the best large family tent from the dome category. It is reported that the HuiLingYang tent uses materials of great quality for fair-weather camping. 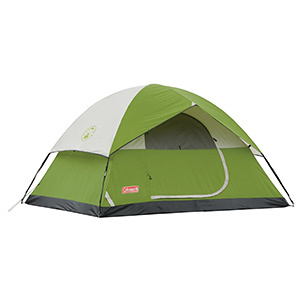 Nonetheless, there are multiple negative reviews that point out the 0 water resistance the tent offers. The additional stakes you get with the tent will make it sturdy in windy weather, while the dual-door design provides cross-ventilation. Still, you’d be better off with another tent if you’ll be camping during rain. The HuiLingYang Instant Pop Up 4 is one of the best camping tents for family members that don’t have much outdoor experience. The installation is literally effortless, while the tent itself is a fine choice for camping during the summer. If you’re planning an extended camping trip, you’ll want to save as much space as possible in your car for personal items. In this case, you should definitely get a tent with compact dimensions. One that won’t leave you penniless while still delivering fantastic value is the Amazon Basics 4-person tent. It’s a best-seller and only costs about $55, also making it one of the best tents for families on a budget. With 6.8 x 24.41 x 6.8-inch dimensions, it’s easy to understand why the AmazonBasics 4 is considered to be the best family camping tent from a portability viewpoint. You can set it up without much struggle, and the take down process is just as easy. The fact that it fits back into its travel bag with visible ease makes it shine among competing tents. Both the tent and floor fabrics are confirmed by customers to be durable, even when it’s extremely windy. 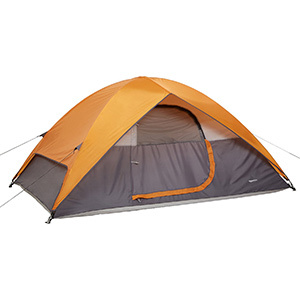 Although there are some design inconveniences like a small rainfly the windows that can only be opened or closed from outside, the AmazonBasics 4 seems to be an all-around quality tent. Another aspect that makes it part of the best family tents for camping is its generous space, despite the fact that it’s noticeably compact when packed up. Be careful with the poles, however, as users have pointed out their poor build quality. Get the AmazonBasics 4 if you want the best tent for family camping with lots of luggage. It will take up minimal room packed while still providing all the space you need when it’s set up. We also recommend it as a best buy for budget shopping. Best family tents reviews play an important role in deciding which 4 person tent you can actually rely on. Out of all the choices on our list, the EUREKA! 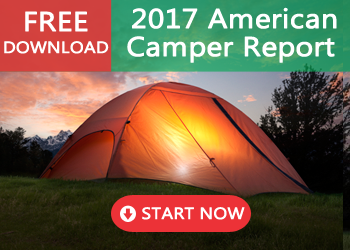 Copper Canyon 4 has the best family camping tents reviews (4.5-star average rating). Indeed, at about $200, the model is on the expensive side, but your investment will be completely worthwhile. 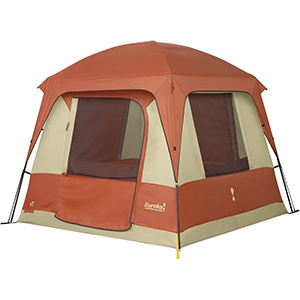 The Copper Canyon 4 also doubles as one of the best large family tents, with a massive 7’ center height. You’ll definitely be a happy camper when going out with the Copper Canyon 4. It was smartly designed to provide a ton of ventilation, as this tent has windows on all sides. Additionally, the roof is full mesh, supplying even more fresh air and even an all-night stargazing opportunity in comfort. Also, with a huge center height, this EUREKA! tent is also among the best cabin tents for families searching for this specific style. Finally, we have a top quality tent that can not only resist high winds, but also severe rainstorms. Although many companies market their tents as being “100% waterproof”, few are in reality. 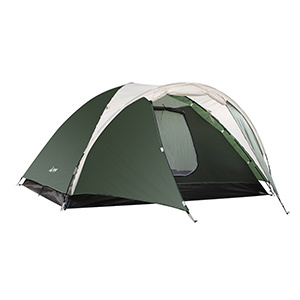 The Copper Canyon 4, though, is praised as one of the top dry tents on the market. We do recommend getting a poly tarp to protect the floor, as the fabric is the same as the walls. Once you have one, you’re guaranteed to have a dreamy camping experience. We recommend the EUREKA! Copper Canyon 4 as the best family cabin tent in terms of ratings, height, dryness, and wind resistance. The few extra dollars you’ll pay for it will be worth the long-term quality you receive. 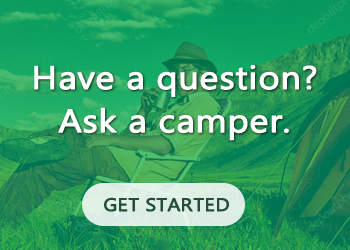 Are you going on a one-time camping trip? Do you have to get the best small family tent on a limited budget? If your answer was “yes” for either of the questions above, the Amagoing tent is for you. 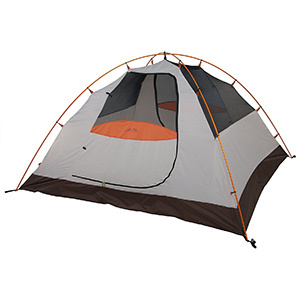 The model is easily the best value family tent on our list, with a current Amazon price tag of $39.98. The impressive 4.3-star average the product has confirmed that it’s well worth the small price you pay. The Amagoing tent may not be the largest one on our list, but it’s big enough to comfortably accommodate a family of four. 180T polyester fabrics were used in the design of the tent, which unfortunately may be too thin for some customers. Also, multiple users mentioned the difficulty with which they repack the tent. Aside from that, installation is reported to be very simple, and the overall tent is incredibly portable. For a tent that’s well under $50, the Amagoing model presents fair quality. It will withstand mild winds, but we don’t recommend taking it out on rugged terrain or when there’s a gloomy forecast. Instead, we encourage you to use the Amagoing tent on the beach or even for your kids to play in the backyard. Provided the weather is fine, this 4 person tent should hold up well, thanks to the 8 metal pegs and 4 windproof ropes. We view the Amagoing 4 person tent as one of the best family sized tents that you can get when shopping on a budget. We don’t recommend it for long-term use, but rather as an affordable solution for camping a few times in nice weather. Without any further ado, the absolute best 4 person family tent we have identified this year is… the Coleman Sundome 4! The #1 best-seller is manufactured by one of the biggest brands in the game and is loved by thousands of customers across the country. At just about $50 on Amazon, you can’t get any better than the value you enjoy with the Sundome 4. You can count on it as the best 4 man family tent for any budget. When you hear the brand name Coleman, you already know that you’ll be dealing with expert design. The reputed company has created a wonderful budget dome-style tent with the Sundome 4, which effectively withstands even the heaviest of rainfall. The tent provides more than enough ventilation, thanks to the extra-large windows. Assembly should take somewhere between 10 and 15 minutes for the average camper. While Coleman is known for making and selling the best camping tents for families, it sadly seems that their quality has lowered in time. Several customers reported that their poles broke easily. On the other hand, you have a genuinely spacious tent that can shelter your 4-member family for a great number of camping trips. If you’re camping when it’s cold, we recommend some cool weather sleeping bags, as the windows of the tent can’t close. 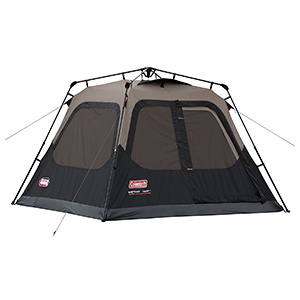 All in all, the Coleman Sundome 4 is the best tent for family of 4 camping in favorable weather conditions. The tent is accessible to all and has all the top features you should look for in a family tent. In conclusion, you can now make an educated decision regarding the best camping tents for family use. We’re confident that at least several best family size tents in our list will be appropriate for your needs. Pick yours according to the footprint, assembly, fabrics, and other useful features. Which model did you find to be the best tent for family of 4? Let’s start up a conversation in the comments with your personal favorites! Toogh 4 season has left my kids in the state of wanting more picnics on daily bases, they really enjoy the tents especially utilizing the two doors for hide and seek games. The mesh pockets gives them the opportunity to hide their snacks beyond my reach. Toogh is cool. Isn’t it amazing when kids grow up just enough to start enjoying the outdoors? That’s the best feeling for us. We experienced a heavy wind at the beach side, surprisingly, the steel stakes held our tent so firm and strong. Outdoor trips I think is best done with Semoo. It sounds contradicting when I say it’s light weighted yet firm. A movement with Semoo was memorable. That’s great news, we’re glad you loved Semoo. We do, too. Thanks for the feedback & happy camping! Mountaineering Lynx 4 has given me reasons to plan a solid camping. All these while, I have been in constant search of a quality tent but i kept seeing ones with lesser quality. I’ll get one more in case of necessity. Thanks for the feedback! What other tents have you tried and were not happy with? We’re sure your answer would help our readers a lot. I love camping! It helps you clear your thoughts and stress that has been built over time. I also highly recommend the Coleman Instant Cabin 4! Even though, as noted the ventilation isn’t great, it’s a perfect tent for a family of 3. It’s roomy and sturdy. Much better than the other tents that we’ve used. Camping is our favorite activity, too, especially when we can take the kids along to enjoy the outdoors. Thanks for the feedback. My family was unhappy with the Toogh 4 Season one because it was not very sturdy and kept falling apart. Frankly I’m quite surprised that this tent has more pros than cons listed. Maybe I got a defective one if this is really true. We’re sorry to hear you had a bad experience, as we are all fans of the Toogh and had no issue camping with it. Thanks for the feedback! The SEMOO is a fantastic tent, even though it has its limitations such as the fact that you can only use it for the summer. For me, that does not matter. And yep it is not easy to set up. Though, I love how strong and how spacious it is. Thanks for the feedback, we also love how spacious the Semoo tent is. I am torn between getting the HuiLingYang or the Lynx 4. Both seem to be sturdy but neither of them appears to be rain resistant which is a big problem. I am going to have to do more research and find out which one is better. If you are specifically looking for camping equipment that can withstand rain, we suggest going for Toogh! It’s ideal for a family of 4 and rain resistant. Of all of the tents I have used I have to say my favorite is the Coleman family tents. What I like about it is that it is very spacious and so easy to put up. The ventilation isn’t great but nothing is perfect, right? 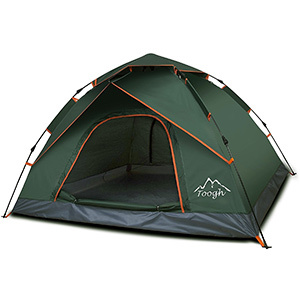 I have not heard of Toogh until my friend had told me about the Toogh family tent, which she had recommended to me because she loves it. From what I read, the materials that are used are concerning, which is nothing she mentioned ever. Have there been a lot of complaints recently about that? There were a few complaints about rain leaking through the seaming of the tent. However, most of the users were happy with how their Toogh tent dealt with light rain. We consider it sturdy enough for light rain so there shouldn’t be any problems. Yeah, the Coleman family tent is alright as there is never an issue with space. You can fit even more than 4 people in as far as I am concerned. But the ventilation is not great and I hope they can improve that with any newer ones made. Thanks a lot for the feedback. We love the Coleman and we haven’t experienced ventilation issues, although we went camping during fall, so maybe in the summer heat, the situation would be different. I didn’t know about Toogh until just this year. We got the tent and we used it during the summer. I did not have any issues with it but I can see why some people complained it was flimsy. The materials seem cheap but it is good for what it’s worth. We only go camping in the summer and it does not matter if the tent we have is not suitable for colder weather as I really am fond of my SEMOO tent. Sure it can be a pain to set up, but once it’s done, it’s good. Are any of these tents good for families of 5 or 6? Because I am not able to find much good information on that. A tent for a family of 4 is not really going to help us since there are 4 kids in the family as it is. I have not found the right tent until I discovered Toogh. And you are correct, that this tent is not all that known. But if you like to go camping all year round, then you are going to want to invest in this one. Thank you for your input on the Toogh tent, Holly! If you only want to go camping during the summer, and if you have the patience to set up a complicated tent, then the SEMOO family tent is the right option. But if you don’t have the patience and you want to camp during other seasons, then this is not for you.